Archangel fights in the Arena and Iceman battles Lord Rask. In the arena of the Chosen, Archangel is forced to battle a large Reject named Agrom. Though he is initially reluctant to fight and kill for the amusement of the Chosen, Lord Rask orders the guards to release the goads, small barbed spheres laced with a drug which saps his control over his wings. In the end, he nearly kills Agrom, and when he turns his rage on the Chosen, is zapped unconscious by the arena's force field, much to Seera's horror. Meanwhile, in the Reject city, Beast joins Zharkah for the birth of a child who unfortunately dies shortly after being born. That evening, at the child's funeral, Beast offers to look into the Rejects reproduction problems, but Zharkah insists that is the way of the Chosen. In the Chosen City, Seera steals nurtient for Christopher, using her telepathy to cover her tracks. 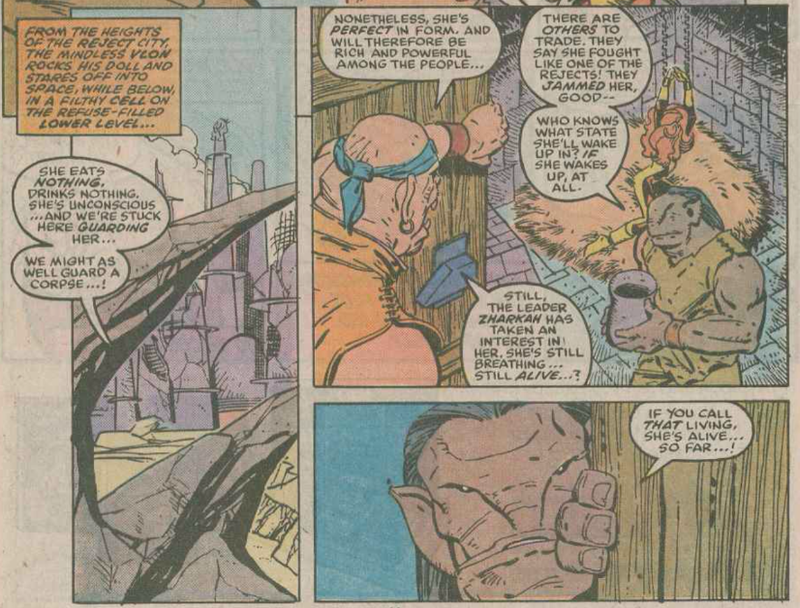 Elsewhere, Cyclops and the Beginagain Dykon encounter the Celestial looming over the cities, and Cyclops wonders if, should all the planet's factions work together, they could drive off the Celestials. The next day, Beast hears word of Archangel's battle in the arena, and, joined by some eager Rejects, begins planning an assault on the Chosen city to retrieve him. In the city's practice area, Iceman and Lev hone their abilities until Rask and a contingent of Chosen interrupt them. Challenging Rask to a dual, Iceman handily defeats him, after which Rask challenges Iceman in turn to face Archangel in the arena, which he accepts. In the cells beneath the arena, Archangel awakens alongside Agrom and vows that, knowing what to expect now from the Chosen's drugs, he'll destroy them. Unknownst to him, however, Seera is watching via a security monitor and, believing herself responsible for his current state, vows to free him before he's forced to battle his friend. 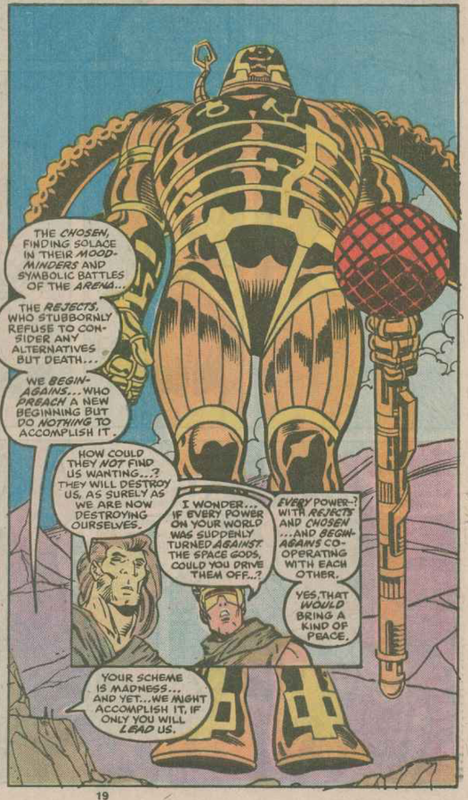 Cyclops' discussion with Dykon at the foot of a Celestial, suggesting that if the Chosen, Rejects and Beginagains all came together against the Celestials they could drive off the aliens is, not surprisingly, ultimately how the Celestials are defeated. Agrom is said to be the son of Vlon, the large Alf-ish Reject sitting atop one of the spires of the Reject city seen last issue. 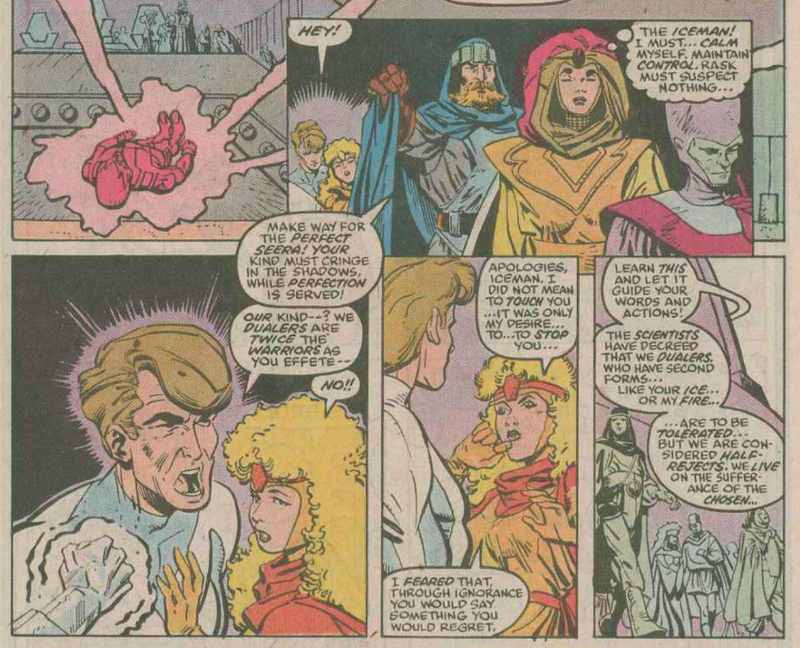 Despite having no memory of his past life, Iceman sticks up for the Dualers and bristles at being talked down to by the Chosen, a nice indication of his personality coming through regardless of the state of his memories. Beast engages in a philosophical debate with Zharkah over whether it's better to trust in a higher power, or use the abilities given by that power to actively work to make the world a better place. It's said that Christopher is telepathically projecting his fear and distress, which Seera is using her power to block. 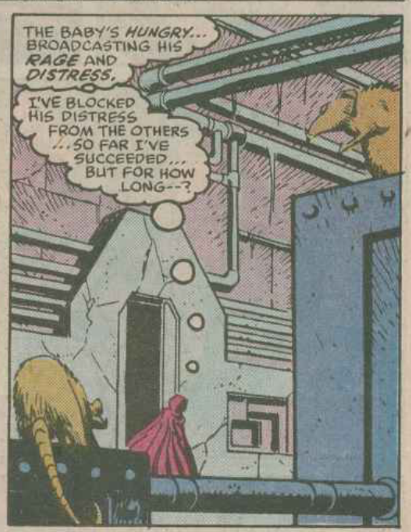 However, other telepaths are starting to notice the "dead zone" where she's blocking their awareness. It's noted that the Chosen mostly only use their powers in battle, whereas the Rejects use them regularly and nonchalantly, which is how the Rejects have held their own against the Chosen in the face of greater numbers. Agrom always reminds me of the behemoth Duke is forced to fight in the Cobra Arena (whom he later befriends) in the first GI Joe animated miniseries. In at least one instance, Beast's universal translator can be seen, still affixed to his chest, a nice little detail. Having established where the characters are in relation to one another last issue, this one starts to move the plot ahead, with that activity bookended by a pair of extended fight scenes. 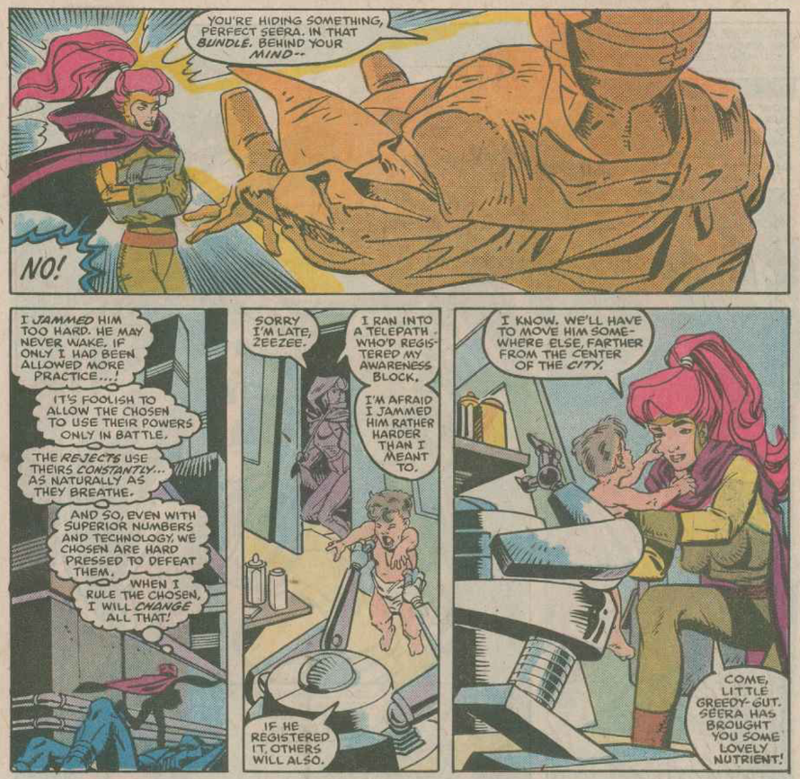 Between those two fights, we see Beast learn of Archangel's location and begin to plot an assault on the Chosen, Cyclops suggest an alternative to the planet being destroyed by the Celestials and Seera, while growing increasingly enamored of Christopher, vow to free Archangel herself as she continues to grapple with the increasingly-obvious shortcomings of her society. 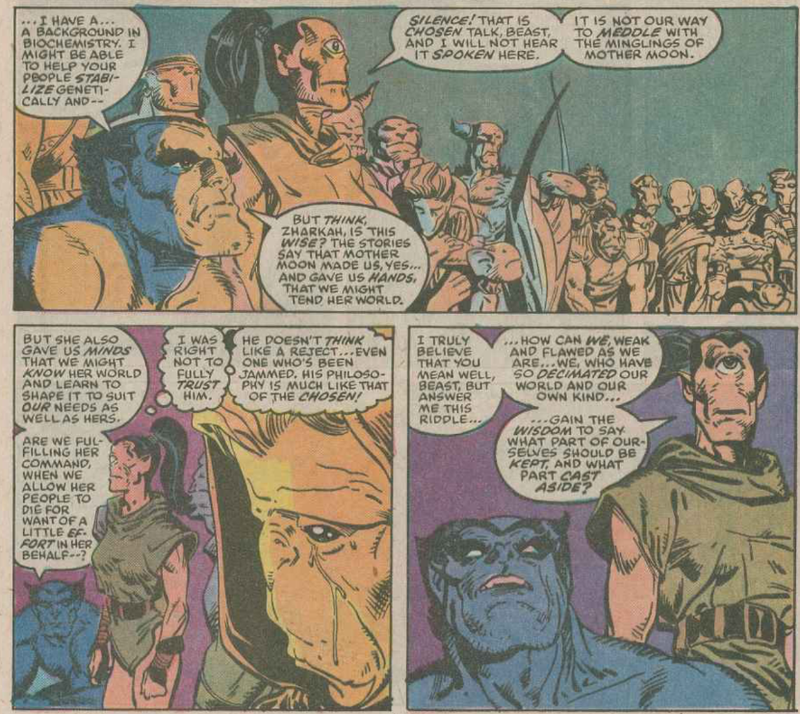 Even while setting the plot in motion, Simonson and Smith continue to build this world, making it feel more fully realized, from little details like Agrom being the son of Vlon, to more philosophical details like the reproductive issues facing both the Chosen and the Rejects, and their respective rationalizations for not doing anything about it. 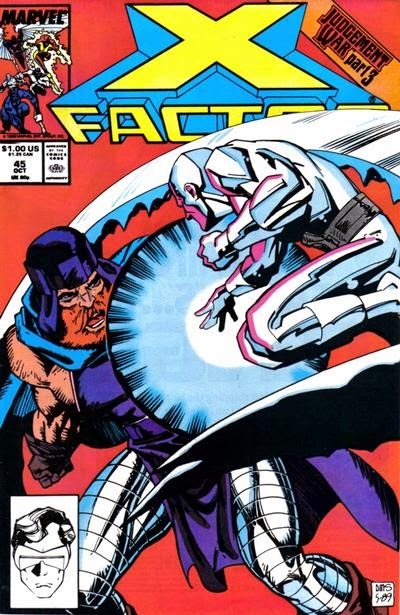 X-Factor as a team is still too scattered/amnesiac for this to feel like they're the actual stars of the story, but there's some effective moments of characterization (I especially like how Iceman, who was trained for one-on-one/small group combat does much better against Rask than in a full fledged melee) that keep them from being too disconnected from the narrative (the unfortunately still unconscious Marvel Girl aside). This is still more a one-off space opera than an X-Factor story, but three issues in, Simonson and Smith have done a good enough job crafting a well-realized world with interesting characters that it's hard to mind that too much. Next week, Uncanny X-Men #250, Excalibur #13 and Wolverine #13-14. "is, not surprisingly, ultimately how the Celestials are defeated." "but three issues in, Simonson and Smith have done a good enough job crafting a well-realized world with interesting characters that it's hard to mind that too much." Me too. Like I said at the beginning, I have fond memories of this story. I'm curious to see if it holds up. So far, so good (though I'm dreading the random fill-in issue, which I've never liked). Nice reference to the original G.I. JOE miniseries. I haven't watched it in years, but I viewed it many, many times in my youth, and my recollection is that the show was never better than those first five episodes (though the second mini-series was pretty good too). Maybe it's more to do with me than the work itself, but I actually have a very poor grasp of where the characters are in relation to one another, and more confusingly than that I have a poor grasp of how/where the various factions come into conflict since they seem physically segregated at times but also intermingle as a caste system. I was speaking more of their position within the story ie Archangel is a captive of the Chosen but with full memory, Iceman is in the city with him but amnesiac, Beast is with the Rejects, Cyclops is with the Beginagains, Marvel Girl is (sigh) an unconscious prisoner, that sort of thing. Totally agree that the physical position of each of them and the respect cities is murky, at best. There's a river, dividing them, I guess, but we don't get a very good sense of how far away they are, what the landscape between them is, whether there's any little cities/villages between the big ones, etc. And, of course, this story falls into the same trap that so much sci-fi does, in that we're on an alien planet being threatened by extinction but the story is focused on a few inhabitants within two nearby cities. Are there Chosen/Rejects scattered all over this planet? Are these cities just their respective capitals? Is the rest of the planet just empty? If so, why doesn't one side or the other just move over there and live in peace? It's basically like if Earth was populated just by the people within Minneapolis and St. Paul. But, like I said, that's pretty common across lots of sci-fi stories (St. Paul would totally be the Reject city, btw). "St. Paul would totally be the Reject city, btw)." I've been going through and re-reading my X-books at the rate of one issue per day, and your blog has been an excellent companion through this project. Eventually, I'll catch up to you, at which point I plan to participate in the discussions here. And, since I live in beautiful, classy St. Paul, maybe I'll say hi to you at a con sometime. Keep up the fantastic work!